I've had my eye on this wordless picture book for some time and was delighted to find it in my local bookstore recently. The cover entranced me--taunted me from my computer screen, and, as often happens with me, I felt that familiar thump in my chest that happens whenever I stumble upon long-lusted-for books. 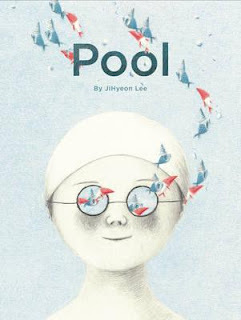 Seoul-born and based illustator JiHyeon has created a thoughtful, lovingly-produced book in her first picture book title--Pool. A young lad approaches an empty swimming pool for a calm and restorative swim, but is soon bowled over by a crowd of agressive water-lovers and their various inflatable devices. The pool is soon crammed to bursting, with nary an inch of surface space to spare. The boy simply stands on the edge of the pool and watches before gently lowering himself into the water and diving deep below. Beneath the watery revellers. Where all is calm. There's he meets another young diver--a girl, and the duo head off into the depths of the pool to explore, discovering beautiful corally enclaves, striking fish and nonsensical sea creatures--a journey of beauty and wonder. When the children finally surface, they smile at each other before leaving the pool. Soon after, the train wreck of revellers also leave the pool, but as they do, one small child, plugging the hole of an enormous inflatable ring, stops and turns. Did this sporn-of-the-revellers see something strange popping from the water's surface? Will she return to the water to explore--and dare to go deeper? This is a supremely beautiful book with incredible layers of meaning and depth that will delight any reader, even those who aren't quite old enough to consciously connect with that meaning. I love the tenderness and strength of the two diving children and the understanding that beauty and serenity is available to us all, if only we are willing to go deep enough--and stop making so much noise. See more of Ji's stunning artworks here.